Probably the greatest fighter aircraft of all time, the Spitfire established a reputation in the Battle of Britain that carried through the war years and has survived to this day. Designed by a team headed by R. J. Mitchell, the prototype Spitfire made its first flight in March 1936, and in all a total of 22,759 aircraft were built. It is fitting that a kit of this famous aircraft be included early in this new 1:48th scale series, and even more so, that the model chosen is that of a Mk. VB, one of the largest production variants. 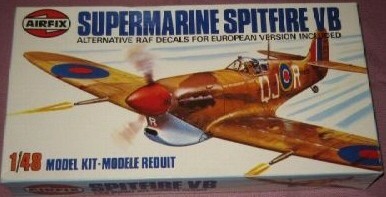 Full cockpit detail is provided in this 53-part kit and optional items and markings enable one of two versions to be built, a European-based aircraft or a tropical Spitfire VB flown by one of Britain's most famous fighter pilots.